What's Your Museum Moment Story? I'm dashing around airports today, but I wanted to put this quick question to ExhibiTricks readers and the Internet hive-mind: What's your Museum Moment story? What is a strong memory of an experience that shifted your thinking about museums, and their place in your life, forever? 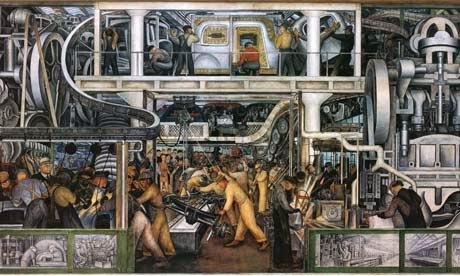 I know one of my earliest museum moments definitely involves Diego Rivera's frescoes at the Detroit Institute of Arts. It's something I've been thinking a lot about lately, inspired in part by the work of Susie Wilkening and Reach Advisors, but also from anecdotal evidence of individuals within the same families becoming either "museum advocates" or "museum avoiders." What are the commonalities, and how can museum folks create more truly transformational and inspiring experiences from digging into these museum moments stories? It's all still whizzing around my head, but I'd love to get YOUR thoughts about this in the "Comments" section below.